In this episode, a special expert joins us to talk about digitizing and storing your old movies, videos, and pictures—even further updating those old movies you’ve already put on CD. You’ll hear a juicy clip from our exclusive Genealogy Gems Book Club interview with the editor of the new Laura Ingalls Wilder biography, Pioneer Girl. And Your DNA Guide is here with a story of DNA and the President. Genealogists are losing sleep lately because of a new DNA tool, but in a good way! I’m talking about AncestryDNA’s release of its Common Matches tool. Diahan Southard, our resident DNA expert, shared the breaking news on our website recently, within hours of when the new tool when live. She loves it so much she’s already spent hours using Common Matches, which she says is blowing her genealogy mysteries wide open. This tool pulls out shared matches between two people who match at 4th cousins or closer. The tool is on AncestryDNA’s main match page, between the “Pedigrees and Surnames” filter and the “Map and Locations” filter. This link will take you to a blog post on our site with Diahan’s great visuals and explanation of how to use this new tool. Have you tried it? Let us know how it works for you. We’d love to hear your success stories and how you’re making the most of DNA testing for genealogy. Recently Backblaze, a sponsor of this podcast, let us know that we can now activate an extra layer of security to better protect the data we have stored with them. The feature is called two-factor verification. It requires that we present both our account credentials and a verification code from a second device to gain access to our Backblaze account. That means someone who was trying to steal our data would have to have both our account information and access to the phone that's tied to the account. The option to require both these security steps can make Backblaze’s solid security even more powerful. It’s like you’re giving Backblaze permission to lock the doors to your data with two different keys instead of a single one, because you’re willing to take the time to use that second key whenever YOU need access. This is just one more reason I’m glad I’ve chosen Backblaze as the official cloud-based computer backup service of Genealogy Gems! I sleep more easily knowing Backblaze is backing me up, 24/7, without me having to do anything but live my life, create and edit the many files that bring you this show, and keep my Backblaze subscription current! If you’re a RootsMagic user, did you install the required update recently so it will continue to work with FamilySearch? On July 30, last month, FamilySearch made some changes to its own site, which required RootsMagic to tweak things on their end to keep up. If you’re running RootsMagic 7, look for the “Update Available” indicator in the lower right corner of your RootsMagic 7 program screen, and click on it. You will then be able to continue working with FamilySearch Family Tree as if nothing has changed. If you’re running Rootmagic 6, you can either upgrade to version 7 for around $20 or you can download the free RootsMagic 7 Essentials version and switch back and forth between them with the same database. Thanks for helping us spread the word to other RootsMagic users who are now scratching their heads when trying to work with FamilySearch FamilyTree! This is NOT just a problem Louis is having! In fact, I venture a guess that most people with online trees in more than one place have this problem and some may not even realize it. I look at my RootsMagic database on my computer as my MASTER database and tree. I may post things online, but only copies. Websites come and go and I want to keep ownership of my own master file on my own computer. With this kind of thinking, I can post my tree online but not lose control of it! When I post tree data online, I’m going fishing for family, so to speak. I’m trying to connect with cousins and gain research leads. With that in mind, I upload only the portion of the tree for which I want to generate those connections and leads. I don’t put my entire tree on each site because I don’t want to get bogged down with requests and alerts for far flung branches that I’m not focused on researching right now. To do this I make a copy of my database, edit it to fit my research, and then upload it. As I find documents and data on genealogy websites, I may “attach” them to the tree on that site, but I always download a copy and retain that on my computer and make note of it in RootsMagic. That way I retain control of my tree and my sources. If you’re lucky enough to have old home movies, then you are probably really concerned about how to preserve them and how to get them into some kind of format that you can share with your family and use in your own family history projects. And what about digitizing and preserving our old photos? We all have those. It can all seem like a pretty daunting task, and that’s why I’ve invited Digital Film Conversion expert Kristin Harding from Larsen Digital in for a chat. Here at Genealogy Gems we’ve been talking lately about the importance of backing up all your computer files, particularly since our experience with our new sponsor Backblaze has shown us how easy and inexpensive it is to have a first-rate cloud back-up service. But there’s an important step that has to happen before you can back something up: you have to digitize it in the first place! Gengem10 gets Genealogy Gems listeners 10% off! 1-800-776-8357 or send an email to info@larsendigital.com. Prioritize items that are the oldest, most special or rare, fragile or deteriorating (capture that image before it crumbles or fades). Resolve to scan at a higher resolution: Scan old family pictures at 600dpi for 4 x 6 photos. Very small photos (and images you want to enlarge from a small portion, like a group photo) should be 1200 dpi. That way, when you enlarge them, you’ll get the sharpest, most clear image possible. Consider the benefits of a professional scanning service like Larsen Digital: Professional scanners are faster and you get better color quality and contrast in your digital image. When customers bring in their photos, they all say “I just don’t have the time to do this myself!” Also, once a photo is scanned, it then usually needs to be cropped and digitally color corrected. Navigating your way through Photoshop if you are a novice can be time consuming & frustrating, and a pro can do this post-scanning editing. Customers usually have slides and negatives, which are much more complicated to scan than photos. They often turn these over to a professional scanning company to ensure that they preserving their family memories at the highest quality. Learn more about how to organize the filenames of all your old images in a two-episode series on the free Family History Made Easy podcast: episodes 32 and 33. Genealogy Gems Premium members can also access my 2-part instructional video series, “Hard Drive Organization” (where you can WATCH how to organize your computer files). What about moving images? So many of us have old home movies. And we have them in lots of different forms like Super 8, and VHS. You are pretty adamant that we should preserve our old home movies as MP4 digital video files, not just on DVDs and CDs as many of us have done over the past several years. DVD’s don’t last forever! The ability to read DVDs from our devices is already fading. Digital video files also offer the convenience to edit your footage and upload files online to easily share with friends & family. But it is convenient to have these on CD and DVD, also, to easily share with relatives and pop into a DVD player (for those whose televisions aren’t hooked into their computers). These “hard copies” can be kept in a safety deposit box for safe-keeping. When MP4s are saved on our hard drives, then they’re easier for our cloud back-up service to keep backed up. Listen to an excerpt from our interview with Pamela Smith Hill, editor of Pioneer Girl: The Annotated Autobiography of Laura Ingalls Wilder, edited by Pamela Smith Hill, is the never-before-published autobiography Laura wrote in the 1930s. The stories and memories she shares in it are the basis for her popular Little House children’s series. Get the Full Interview: Genealogy Gems Premium members have exclusive access to the full interview in the upcoming Genealogy Gems Premium podcast episode 127, to be published later this month. Your membership—just one low annual fee--gives you access for a full year to all the monthly Premium podcasts as well as past ones, so you can hear our interviews with other fantastic authors on books we’ve loved. You’ll also have access to our full series of Premium how-to videos, which include the Ultimate Evernote Education series, Google and Google Earth, and my other hottest topics. 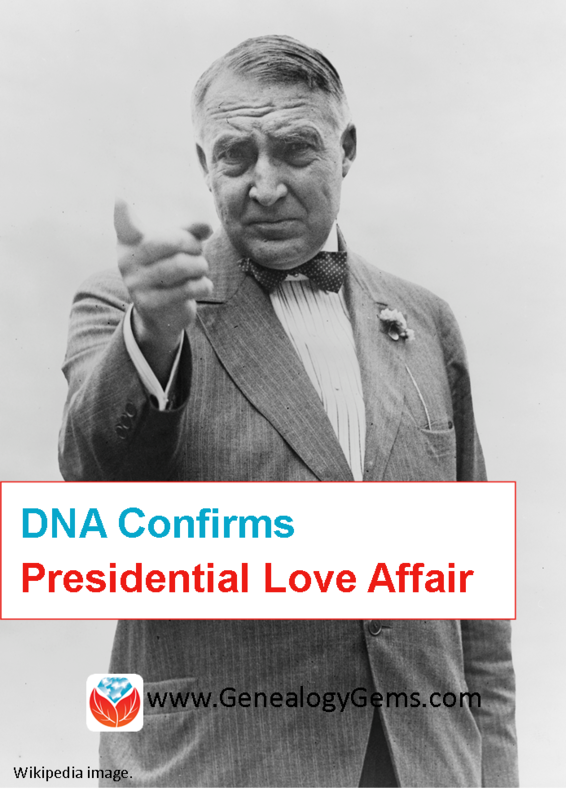 The New York Times recently named former president Warren G. Harding (1865-1923) as the father of Elizabeth Ann Blaesing after her son, James Blaesing, and two individuals related to the Hardings, were found to have shared DNA. Just to be clear, the DNA test results don’t and can’t name a specific relative as the shared source of any two individual’s DNA. Though we would like it to be, it is not DNA in, ancestors name and birth certificate out. The actual report from the testing company was that James Blaesing and Peter and Abigail Harding were second cousins. This means that the shared ancestral couple for these three has to be among their 4 sets of great grandparents. The DNA alone cannot tell us which set. It was a combination of the DNA and the known genealogy that provided such a high level of confidence in this case. While there are certainly mixed feelings among members of the Harding family about this new evidence, this is clearly a win for DNA. A man who was thought to have never had children did in fact have one child, and now a grandchild. This preserves a genetic legacy for his family line that might have otherwise been lost. This is also a clear win for the power of curious descendants and the healing balm of time. It was actually Harding’s grand niece and grand nephew who instigated the testing out of a pure desire to know the truth. Time has allowed them this curiosity without threat of scandal and technology has provided the necessary tools to once and for all more fully understand their ancestor and the life he lived. AncestryDNA declared after this story broke that DNA testing can rewrite history, which may be true. However, I prefer to think of DNA testing not as white out that can erase false accusations, but rather as a filter that allows you to separate fact from fiction so that history can reflect lives rather than lies. Here’s a link to a related article that also comments on the lack of African DNA in Harding’s descendants. Get Diahan's DNA quick reference guides to help you easily navigate your own genetic genealogy journey.